SMS stands for Short Message Service and is another name for a text message. An SMS is generally sent from one mobile device to another over the cellular network. SMS is a text-only standard first formalized in 1985 in the Global System for Mobile Communications (GSM) standards. A single SMS is limited to 160 GSM-7 characters, however most modern mobile phones are capable of segmenting and re-assembling messages up to 1,600 characters. To fit emojis and other characters outside the GSM-7 alphabet in text messages, UCS-2 character encoding is used. A single unicode character causes the whole text message to be encoded using UCS-2, which limits messages to 70 characters. The limit was originally set because SMS was designed to fit in between existing phone protocols. After it took off, the limit was then enshrined in the SMPP Protocol. SMPP is how text messages are transmitted between carriers. Natively, SMS can't handle pictures, videos, or multimedia attachments. To serve those purposes, in 1999 the MMS standard was ratified. MMS stands for Multimedia Messaging Service which enables people to send pictures, videos, and attachments over text messaging channels. Once the multimedia is received by the destination carrier the carrier sends a SMS asking the phone to download the content. The standard for SMS was agreed upon in 1984 but the very first text message ever sent was from Neil Papworth on the Vodaphone network in 1992. You'll be happy to know it was a happy one; "MERRY CHRISTMAS" was the body of Neil's original text. From SMS's very humble beginnings, text messages have exploded onto the scene. Every year, trillions of text messages are sent between SMS-capable devices. An entire ecosystem has grown up around text messaging; SMS Marketing is now a huge industry, while other applications have built safety and support services onto the SMS platform. All the while, it's also remained a tremendous way to keep in touch with friends and loved ones. With the popularity of SMS, it was inevitable that business use cases would grow up around texting. SMS remains one of the best ways to communicate with customers and boasts a 5x open rate when compared to email. SMS Notifications and SMS Marketing have both proven to be great applications of text messaging in business. Combining the extremely high open rates, universal receiving capability, and always-present nature of mobile devices, they're an excellent way to communicate with customers. For service, too, the informal nature of an SMS is sometimes the perfect touch for business applications. 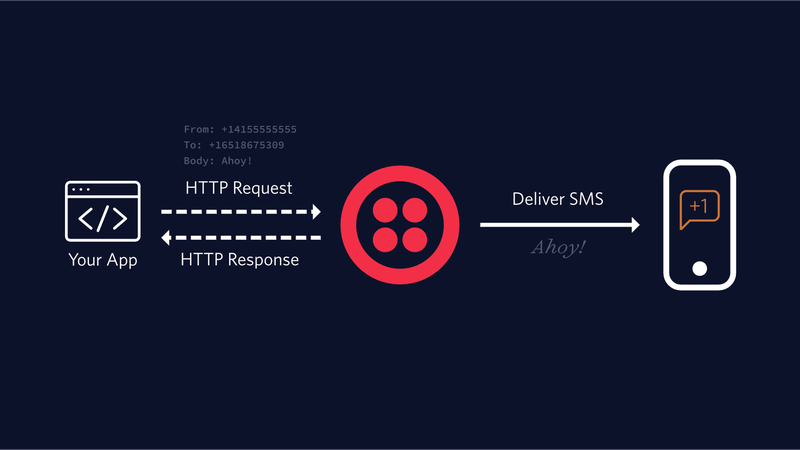 Twilio has had an SMS API since the very beginning - and over the years we've scaled the service to adapt it to changing customer needs. Using Twilio's Programmable SMS, you can quickly integrate text messaging capabilities (sending and receiving) into your web, mobile, or desktop application. Once you're ready to take it to the next level, Twilio Notify can help you add SMS Notifications (and other channels) for delivery or status updates to your business. We also have laid out plays for you to add other common use cases such as SMS Marketing to your business's repertoire; see our learn articles for game-plans for the solutions you need.